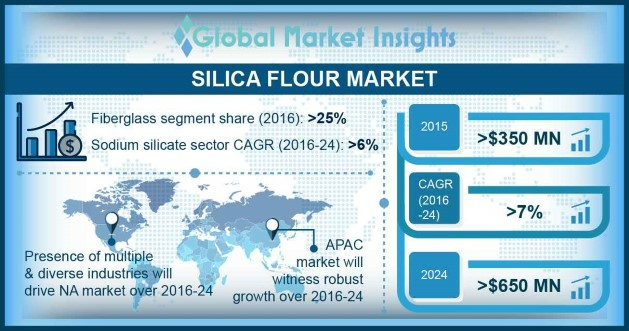 Silica Flour Market size was worth over USD 350 million in 2015 and is expected to grow at over 7% between 2016 and 2024. Increasing glass demand and thriving construction industry are the major factors spurring the growth of silica flour market globally. Improved living standards, enhanced lifestyles and variations in climates have extended the innovations in glass sector on a regular basis as per the consumer demand. The rise of new commercial and residential projects in developing countries will steam up the demand for the product. Increasing usage for glass in downstream commercial enterprises and packaging applications will boost the consumption of silica flour. In next couple of years, the product will have wide-scale applications in the oil-well industry. There is a minor risk associated with prolonged exposure to the product, which was observed by some regulatory bodies globally. Hence, manufacturers need to comply with frequently amended workplace safety guidelines, which might reduce their profit margins. These factors can slow down the silica flour market in near future. Fiberglass accounts for a significant share in applications of silica flour market. Fiberglass is used in new buildings in developing and developed regions to comply with environmental norms. It helps in maintaining the temperature of buildings by minimizing the heat exchange from the building interior to its surrounding and vice versa. Fiberglass is also used extensively in vehicles to restrict the outside atmosphere from interfering with vehicle comfort. Increasing fiberglass usage in multiple and diverse industries will bolster the product market. Sodium silicate is next substantial application for silica flour. Sodium silicate possesses many properties, which make it more beneficial than other alkaline salt and is used in a wide spectrum of applications owing to its low cost. It is used as zeolites, chemicals, deflocculates, catalyst bases, anticorrosive, coagulant aids, binders, cement, detergents, and adhesives in industries. Various functional characteristics and properties of soluble silicates are used economically and efficiently to solve wide problems in chemical and industrial processes. The positive outlook of all these industries in future will foster the Silica Flour market growth. Silica flour is extensively consumed for fiberglass manufacturing in the construction and renovation industry. Increasing adoption of fiberglass in the construction industry can be attributed to its distinguished insulation properties. Further, fiberglass application is growing in automotive manufacturing and transportation sector for aesthetic and security applications. Rise in construction activities and automotive industry due to the increase in global population will push the Silica Flour market during the forecast period. Glass is a crucial component in plenty of products that are used in daily life. It is used to produce renewable energy in wind turbines and solar panels, fiber optic cables, and for life cycle engineering, biotechnology, medical technology, electronics appliances, housing, tableware, and packaging. Escalating glass consumption in all these applications has bolstered the product market in the last decade and will continue in future. Carbon black and amorphous silica are used as reinforcing fillers in the rubber industry. Silica flour is an essential reinforcing filler to increase tire’s longevity and strength and achieve longer lasting products. These reinforced filler tires reduce greenhouse gas emissions from vehicles, especially due to silica. Increasing penetration of vehicles has flourished the tire industry and augmented the usage of silica flour. Asia Pacific has been spearheading in terms of consumption in silica flour market. China and India witnessed a rise in construction spending on residential & industrial projects in the recent years. Food & beverages, personal care products, and electronics sectors are growing at a rapid pace in this region and in turn increased the glass consumption. North America had witnessed a substantial upsurge in tire industry due to automobile giants such as “General Motors” and “Ford Company”. Flourishing tire industry have increased the product consumption as a reinforcing filler in this region. Moreover, the U.S. is always recognized globally, for its renewable energy resources such as solar cells, wind turbine, etc., leading to increased glass usage for these applications. Multiple and diverse industries in North America have spurred the growth of silica flour market in this region. Europe, especially Germany is recognized all over the world for its outstanding automotive industry, providing a base to pioneers such as BMW AG, Mercedes-Benz, Porsche AG, Volkswagen AG, and Audi AG. etc. These producers are implementing fiberglass in their vehicles to achieve a competitive edge. Further, these companies have grown industrial construction leading to the consumption of sodium silicate in the form of cement, binders, chemicals, adhesives, and detergents. All these have translated into a flourished silica flour market in recent years and will continue to ramp up during the forecast period. The silica flour market is majorly concentrated in the U.S. with companies such as Silica Holdings, Inc., Premier Silica LLC, and SCR-Sibelco N.V. Prominent producers are AGSCO Corp, Delmon Group of Co., FINETON Industrial Minerals Ltd., Saudi Emirates Pulverization Industries Co., Sil Industrial Minerals, Inc., and Opta Minerals, Inc.
Other key industry players in silica flour market include Hoben International Limited, International Silica Industries Company PLC, Premier Silica LLC, and Adwan Chemical Industries Co., Ltd.
Silica flour is used as a filler in mortar and plastics to enhance its quality and to reduce the quantity of tar required to fill the mold. The product is used as a rough substance in paints, toothpaste, skin products, and cleansers and as a filler for pharmaceutical products. It is produced by granulating silica sand into a fine powder. It is also used for earth, tile, porcelain, fired and glass creation, and in foundry work. Rapid industrialization coupled with urbanization will drive growth.